1. Help stop the Asian turtle crisis. The majority of Asian turtle populations have been critically diminished by over-collection, particularly for delicacies in restaurants and live animal markets. Dealers are now targeting turtle populations elsewhere, such as in the United States and Europe, to meet the Asian demand. The U.S. Fish and Wildlife Service has identified this as the "Asian turtle crisis," and it has spearheaded efforts to protect turtles from the trade. 2. Get turtles out of U.S. live animal markets. Turtles are among the most popular offerings at live animal markets in the United States. They suffer terrible abuse in filthy, neglectful conditions, and they are slaughtered by being cut apart while conscious. The vast majority of market turtles are taken from the wild, contributing to declining U.S. turtle populations. Tell state wildlife agencies that you're concerned about the increasing collection of wild turtles and tortoises to supply animal markets in the United States and abroad. If wildlife is being sold for food in a live animal market in your state, contact your local and state legislators, asking that they ban the practice. You may also find it effective to contact state and local health departments (check the Centers for Disease Control web site for listings), which are responsible for sanitary conditions at live animal markets. Finally, contact state wildlife agencies about the dangers that non-native and diseased market animals may pose to local wildlife if released. 3. Don't pollute or litter. Pollution makes its way into bodies of water and wild areas, poisoning turtles and tortoises and destroying their habitats. Always properly dispose of any hazardous materials such as paint or oil. Garbage, such as plastic bags, kills many pond turtles and sea turtles who either ingest it or become entangled in it. Reduce the amount of garbage you produce and dispose of it properly. 4. Protect turtle and tortoise habitat. Become active in your local conservation commission or parks and recreation department, and work to preserve turtle habitat. 5. Stop turtle and tortoise exploitation. Avoid activities such as turtle races. They involve taking turtles out of their natural habitats and exposing them to many dangers, not to mention an enormous amount of stress. Races can harm individual turtles as well as entire local wild populations. 6. Give them a brake. If you see a turtle or tortoise crossing a road, gently pick him up and carry him across in the direction he was headed. (Be watchful for cars in the process.) If the turtle is a large one, or a snapping turtle, use a stick to nudge him gently across the road without getting too close. 7. Enjoy turtles and tortoises in the wild. Never keep wild turtles or tortoises as pets or buy them from a pet store. The trade in reptiles as pets is responsible for tremendous animal suffering and serious damage to turtle and tortoise populations. Learn to enjoy these animals by observing them in their natural habitat, where they belong. 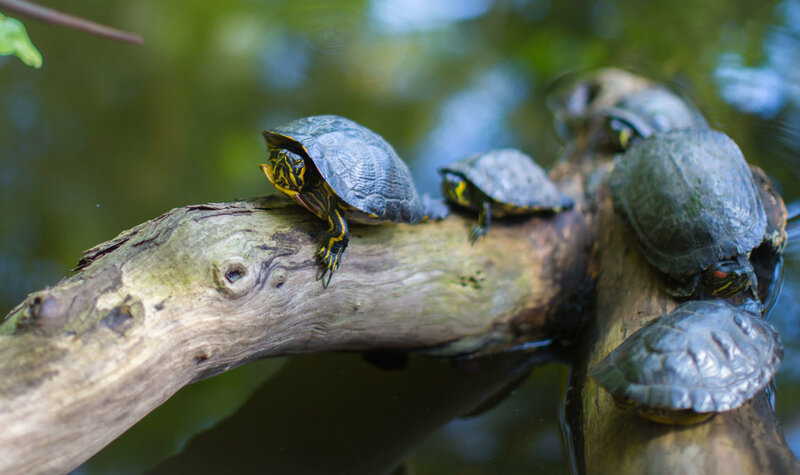 If turtles or tortoises live in your yard, why not keep them happy by building a pond and by landscaping with plants that provide protection and food? Edible plants such as tropical hibiscus, dandelion, geraniums, and Chinese lantern can be quite appetizing. (Make sure that your plants are free of pesticide and herbicide residue.) Piles of leaves, vines, and downed trees make perfect hiding places. Steer clear of the beach at night during the summer. Your presence will frighten nesting sea turtles back into the sea, preventing them from laying eggs and jeopardizing any eggs they have laid. Do not shine bright lights on the beach at night. Oppose coastal development such as condominiums, houses, resorts, and hotels; they tend to expose beaches to excessive artificial lighting, which discourages female turtles from approaching the beach to lay eggs. The light also draws hatchlings away from the ocean, disorients them, and exposes them to predation and deadly dehydration. Tell local authorities if you see any person harassing or poaching a sea turtle, her eggs, hatchlings, or nests -- or those of any other endangered turtles and tortoises. These activities are violations of U.S. state and federal laws. 11. See what you can do. Several groups are involved in research, conservation and advocacy work to protect turtles and tortoises. Join one of these groups to stay informed. Educate others about the importance of protecting turtles and tortoises from commercial exploitation and abuse in your community and throughout the world. Be a voice for turtles.